Evidence of religious practices in this area date back approximately to 5500 BCE. Around 3000 BCE there appeared the first signs of urbanization. Between 2500 and 2000 BCE the Indus Valley Civilization was at its peak. The Indus Valley script remains undeciphered down to the present day, the numerous seals discovered during the excavations, as well as statuary and pottery, not to mention the ruins of numerous Indus Valley cities, have enabled scholars to construct a reasonably plausible account of the Indus Valley Civilization. Vestiges of the civilization were found as far apart as Sutkagen Dor, near the shore of the Arabian Sea 300 miles (480 km) west of Karachi, also in Pakistan, and Rupnagar, in India, at the foot of the Shimla Hills 1,000 miles (1,600 km) to the northeast. Later exploration established its existence southward down the west coast of India as far as the Gulf of Khambhat (Cambay), 500 miles (800 km) southeast of Karachi, and as far east as the Yamuna (Jumna) River basin, 30 miles (50 km) north of Delhi. A thousand miles to the east in India, Harappan settlements have been found beyond India’s capital, New Delhi in Uttar Pradesh State. Discoveries in Lothal and Gola Dhoro and Dholavira in Gujarat State suggest a southern coastal network spanning hundreds of miles. The Indus civilization apparently evolved from the villages of neighbours or predecessors, using the Mesopotamian model of irrigated agriculture with sufficient skill to reap the advantages of the spacious and fertile Indus River valley while controlling the formidable annual flood that simultaneously fertilizes and destroys. The civilization subsisted primarily by farming, supplemented by an appreciable but often elusive commerce. Wheat and six-row barley were grown; field peas, mustard, sesame, and a few date stones have also been found, as well as some of the earliest known traces of cotton. Domesticated animals included dogs and cats, humped and shorthorn cattle, domestic fowl, and possibly pigs, camels, and buffalo. The elephant probably was also domesticated, and its ivory tusks were freely used. Minerals, unavailable from the alluvial plain, were sometimes brought in from far afield. Gold was imported from southern India or Afghanistan, silver and copper from Afghanistan or northwestern India (Rajasthan), lapis lazuli from Afghanistan, turquoise from Iran (Persia), and a jadelike fuchsite from southern India. Perhaps the best-known artifacts of the Indus civilization are a number of small seals, generally made of steatite, which are distinctive in kind and unique in quality, depicting a wide variety of animals, both real—such as elephants, tigers, rhinoceros, and antelopes—and fantastic, often composite creatures. Sometimes human forms are included. There are great numbers of small terra-cotta figures of animals and humans. Some kind of centralized state, and certainly fairly extensive town planning, is suggested by the layout of the great cities of Harappa and Mohenjodaro. The same kind of burnt brick appears to have been used in the construction of buildings in cities that were as much as several hundred miles apart. The weights and measures show a very considerable regularity. The Indus Civilization had a writing system which today still remains a mystery: all attempts to decipher it have failed. • Harappa was an Indus civilization urban center. It lies in Punjab Province, Pakistan, on an old bed of the River Ravi. • The latest research has revealed at least five mounds at Harappa that 3D renditions of Harappa show to have been surrounded by extensive walls. Two mounds have large walls around them, perhaps as much for trade regulation as defense. • A structure once considered a granary is now thought to have been a large building with ventilated air ducts. A set of working platforms to the south of this structure are also of great interest to archaeologists. 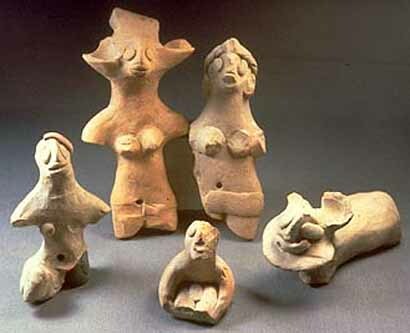 • An abundance of terracotta figurines at Harappa provided the first clues in the 19th century to the ancient Indus often abbreviated as Harappan civilization. 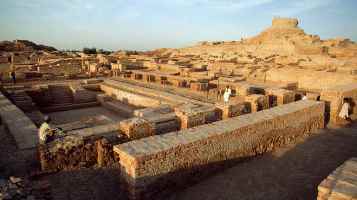 • Mohenjodaro is probably the best known Indus site. Mohenjo Daro is in Sindh, Pakistan, next to the Indus River, not far from the very early human flint mining quarries at Rohri. • Here the Great Bath, uniform buildings and weights, hidden drains and other hallmarks of the civilization were discovered in the 1920’s. This is where the most unicorn seals have been found. • Dholavira is located on Khadir Beyt, an island in the Great Rann of Kutch in Gujarat State, India. It has only been excavated since 1990. As large as Harappa and Mohenjo Daro, it has some of the best preserved stone architecture. • A tantalizing signboard with Indus script has also been discovered. • Dholavira appears to have had several large reservoirs, and an elaborate system of drains to collect water from the city walls and house tops to fill these water tanks. • Lothal is on the top of the Gulf of Khambat in Gujarat, India, near the Sabarmati River and the Arabian Sea. It is the most extensively researched Harappan coastal site. • A bead factory and Persian Gulf seal have been found here suggesting that like many sites on the Gulf of Khambat, it was deeply into trading. • Rakhigarhi is a recently discovered city in Haryana, India. Partial excavations have revealed that it is as large as Harappa, Mohenjo Daro and Ganweriwala. • Ganeriwala is in Punjab, Pakistan near the Indian border. It was first discovered by Sir Aurel Stein and surveyed by Dr. M. R. Mughal in the 1970s. It spreads over 80 hectares and is almost as large as Mohenjo Daro. • Gola Dhoro (also known as Bagasara) is a site in Gujarat, India, excavated from 1996 to 2004. • Daimabad is in Maharashtra near Bombay. Discovered in 1958, it is a controversial site. • Chanhudaro is 80 miles south of Mohenjo Daro in Sindh. It was a manufacturing center. • Sutkagen Dor in Baluchistan is the westernmost known Harappan site located on the Pakistani border with Iran. By 1800 BCE, Writing started to disappear, standardized weights and measures used for trade and taxation purposes fell out of use, the connection with the Near East was interrupted, and some cities were gradually abandoned. The reasons for this decline are not entirely clear, but it is believed that the drying up of the Saraswati River, a process which had begun around 1900 BCE, was the main cause. Other experts speak of a great flood in the area. However, one thing is clear: the city was already in an advanced stage of economic and social decline before it received the coup de grâce. Deep floods had more than once submerged large tracts of it. Houses had become increasingly shoddy in construction and showed signs of overcrowding. The final blow seems to have been sudden, but the city was already dying.